How simple can it be? If you are a minimalist and like to mess with small electronics projects then you should meet the SA602 chip. 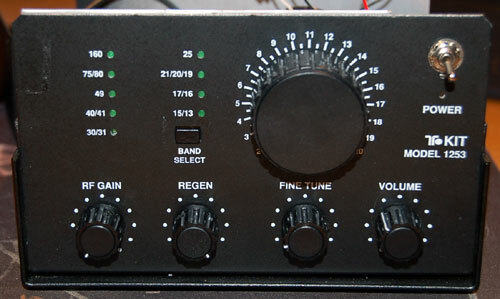 The Signetics SA602 IC is a double balanced mixer and tunable oscillator in one shot. Sounds to me like the front end of a receiver. 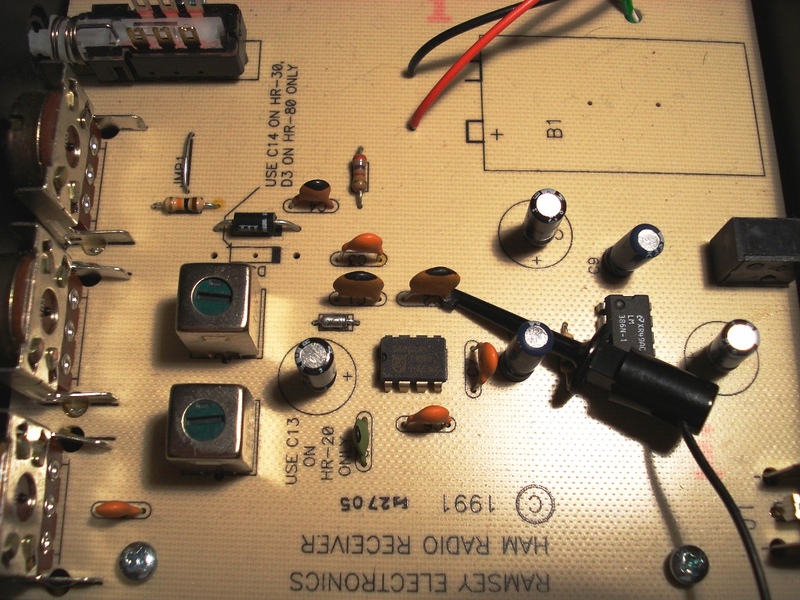 By adding a handful of other components to the SA602 you can build a direct conversion reciever. Direct conversion means that you process the incoming RF signal at its frequency without down converting it to an IF (Intermediate Frequency) and then processing the IF frequency. The least frustrating way to mess with the SA602 is to buy the Ramsey HR Amateur Radio Kit. This cost is about $39. These are advertised by Ramsey as QRP receivers and they are available for 20 meters, 30 meters, and 40 meters. These receivers can receive CW, SSB, and AM. The kits differ only in the external components that determine the frequency of the internal oscillator of the SA602. The oscillator in all these kits is a Colpitts varactor tuned tank circuit. The audio section is the very popular LM386 chip – the same in all the kits. I’ve already written about the the non-linear mixing process, varactor tuning, and the LM386 audio amp IC in the article on Superheterodyne (link at the end of this posting). 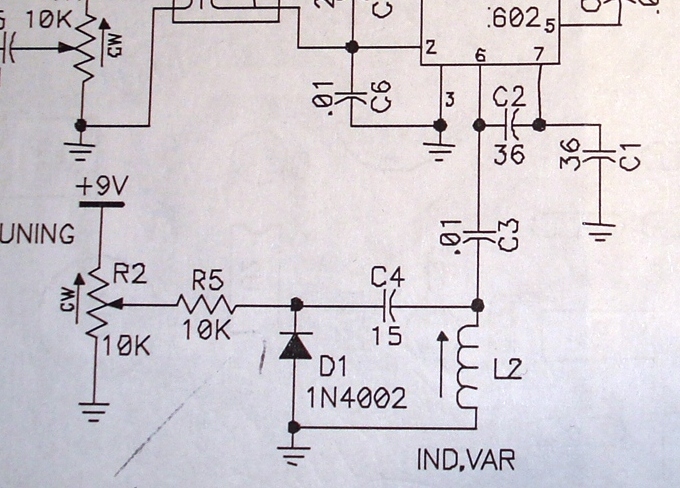 Read that article to get some background on receiver design that uses IF frequencies. This posting is on direct conversion and is an alternative, and historically earlier, radio receiver design. Don’t expect the world from this kit. The kit is used to demonstrate the principle of direct conversion receiver design – this is a design from the 1920’s. In the history of radio, the obvious short comings of this design was overcome by Superheterodyne. I built this kit, performed the alignment, and hooked it up to a 20 ft piece of wire. It actually does work and I heard CW, SSB, and broadcast AM on 20 meters. If you don’t have a scope and you want to check to see if the oscillator in the SA602 is working then use a shortwave radio or ham radio. 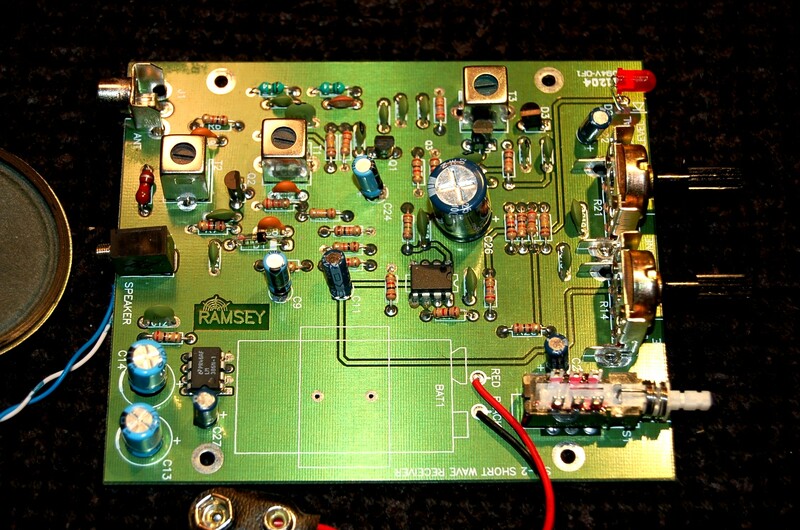 Place the SW radio or Ham radio near the Ramsey circuit board and tune around 14MHz. You should be able to hear the SA602 oscillator as a hissing or dead silence at some point 12MHz-15MHz on the SW radio or Ham Radio. On the front end L1, C6, and C7 provide a rough tuned tank circuit into pins 1 and 2 of the SA602 chip. A 10K pot provides gain control by shunting some of the signal to ground. Pins 6 and 7 of the SA602 want the tuning portion of SA602 internal local oscillator. The oscillator is a Colpitts oscillator varactor tuned by a 10K pot which reverse biases the varactor diode to tweak the capacitance which in turn affects the resonant of the tank circuit (L2 allows rough tuning). The effective capacitance and L2 control the oscillator frequency. For the 20 meter kit, the frequency is tunable around 14 MHz +- about 1 MHz. The SA602 does all the work. 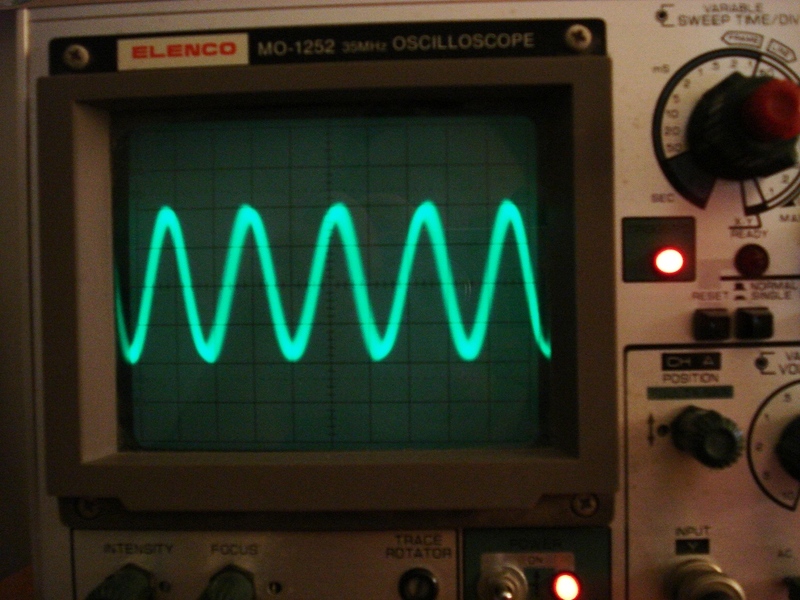 It mixes the incoming signal with the local oscillator, suppresses the carrier, and produces the difference frequencies. Now here is the big deal. For some incoming RF frequency the difference of this mixing process is in the audio range. This is direct conversion. The output of the SA602 is on pin 4. Pin 4 drives the input of the audio section. The audio section is a slam-dunk. Its a black box LM386 audio amplifier. 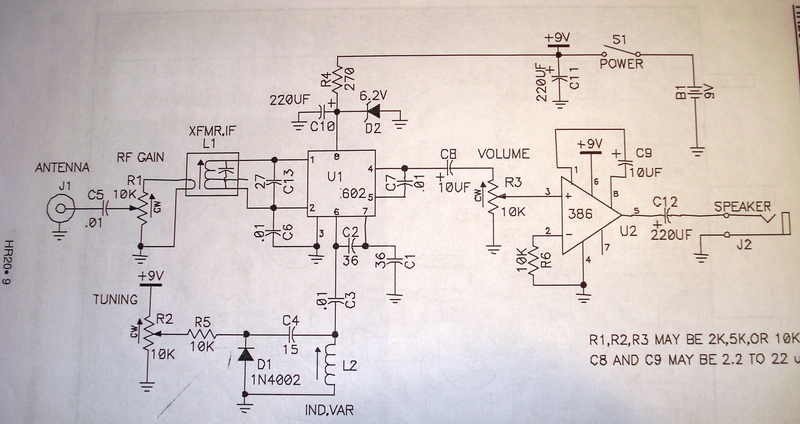 The LM386 has enough gain to drive a small speaker. So, that’s it. At a conceptual level, how much simpler can it be? The HR20 won’t win any prizes for receivers. But, it is a simple kit that you can build in about 1 hr and demonstrate a basic principle of receiver design – Direct Conversion. It is suitable for kids to build and “instant gratification” can be had in 1-2 hrs. Perhaps this kit can trigger the interest in a young kid who may have a yet-to-be-discovered interest in electronic or radio. Or, if you are a older ham with a lifetime of appliance operating then this kit may open the black box of a very basic reviver design that is easy to understand and actually works. The Riddle of Kit Building – why do they do it? 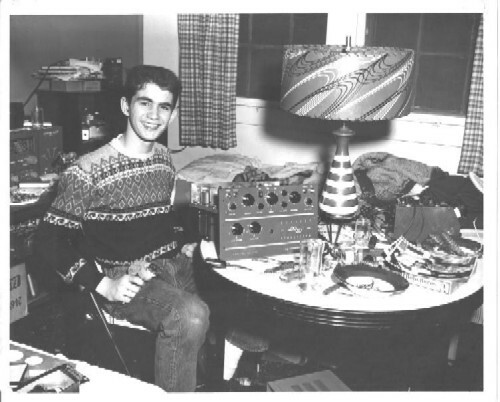 There is a popular book that you will see at Hamfests – Heathkit-A Guide to the Amateur Radio Products. You can also find this book on http://amazon.com. The Guide is a very good reference on all the Heath/Zenith products. In fact, it’s a wealth of information on the history of the company, the products along with beautiful photographs, and a chronological history of the company from creation to decline and extinction. The book is highly recommended if you are interested in the history of the Heath/Zenith company or details about their products. Without knowing the history of the Heath Company one might get the idea that the company had some sort of maternal instinct to Amateur Radio insofar as they created quite a popular and successful line of amateur radio products and test equipment. One might think that the founders of the company had some benevolence for Amateur Radio and then built a company around this core concept and mission. A good trivia question would be: “What is the first kit that the Heath Company produced?” This answer is: a kit airplane – a kit airplane in which the founder of the company was killed. That has nothing to do with Amateur Radio. In the early history of Heath, the company was a generic profit making business in the sense that they had no core mission to develop amateur radio products. After World War II the Heath Company found that they could buy box-car loads of surplus electronic parts from the US Government at rock bottom prices. So, what do you do with box-cars loads of electronic parts? Build the TenTec 1253 9 Band Regenerative Receiver. Listen to shortwave SSB, CW, and AM the old school way. 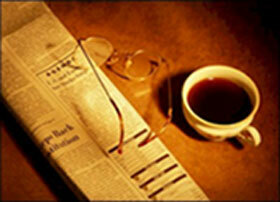 Plus learn something about the history of radio and receiver design. The TenTec 1253 is “old school” insofar as the receiver is a “Genny” or regenerative from back in the 1920s. Its a radio technology from when dinosaurs ruled the earth – before superheterodyne. The TenTec 1253 can receive AM, SSB, and CW from 1.8Mhz to 22Mhz in 9 bands and its a hoot to operate. But the TenTec 1253 is also “new school”. It is new school in the sense that it uses modern components to implement the old school regenerative technique. A true old schooler would use tubes and discrete components to build a Regen. The 1253 is old school in new school clothes. The “new school” part of the 1253 will let you see how some new techniques and technologies work. This includes: varactor diode tuning, integrated audio amplifiers, voltage regulation, and IC-based band switching – no more wafer switches. None of this was around in the 1920s. So only the technique of Regeneration is old. The implementation is new. In 1918 Armstrong developed the Superhetrodyne receiver that incorporated the first local oscillator and intermediate frequency modules. The “superhet” as it is sometimes called qualifies a receiver able to function over a range or band of frequencies. The word “heterodyne” means “beating”, a technique producing a beating or heterodyne frequency by mixing two or more signals in a nonlinear device such as a vacuum tube, a transistor, or a diode mixer. The incoming frequency is converted to a fixed intermediate frequency (I.F.) where amplification and filtering are provided. In addition, in 1922 Armstrong created the super regenerative receiver, a simplified Superheterodyne that improved the gain while simplifying the adjustment of the receiver. The “Regen” as it was called was qualified as a receiver “unsurpassed in comparable simplicity, weak signal reception, inherent noise limiting and AGC action and, freedom from overloading and spurious responses”, nothing less. The “Regen” radios took the most of very few components. However, as parts became easier to obtain, the “superhet” replaced it in all radioactivities. Can we be time travelers? Well, yes and no. We can be kit builders and maybe later, radio experimenters and tinkerers like those Ham Radio folks of the past balancing theory and experiment to refine our knowledge. We can build kits, learn about electronics, and learn about the history of radio all at the same time. What a great deal is that! If any one of the three aspects above can hook you then the others come along for the ride – and if you are not careful, you might learn something. So where are we in time? In the early 1900s we had the Regenerative receiver and the Tuned Radio Frequency receiver. Both of these designs had some drawbacks. The problem with the TRF design is that each stage of the radio had to be tuned to the frequency being received. So as you surfed across the band, you had to retune all the radio stages for that frequency. These radios had as many as 6 knobs to tune the stages as you skated across the band.